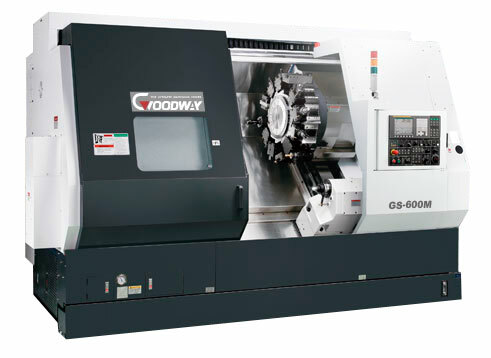 With Leading technologies and the highest quality components, the GS-6000 series ultra high performance turning center combined super high power output, high rigidity construction, large diameter servo driven turret and Goodway 35 years experiences. It provides big working range and super heavy cutting capability. Additional, live tooling turret and C-axis are available to allow GS-6000 series can turning, milling, drilling and tapping. Thus, done in once can be achieved. Furthermore, the excellent machine performance and durable components can meet today and tomorrow's most demanding turning application. The first thing you'll notice inside the door of the GS-6000 series is the massive turret, which boasts a turret disk over 28 inches in diameter. Blazing fast indexing times of 0.5 seconds from station to station and 1.5 second for stations at 180 degrees are achieved with servo indexing technology. Under the covers, you'll find a 45 degrees true slant bed with super wide box ways, and an enormous 2-speed head stock driven by a 60 HP ( Peak ) FANUC motor. Combined Industrial design, the perfect fully enclosed protection covers can isolates cutting chip and coolant inside the machine. Positioning of the programmable base tailstock has been simplified through use of custom software interface. The Z-axis carriage automatically locks on to the base of the tailstock and drags it to the desired position. The built-in bearings quill provide greater rigidity for heavyloads. The extension and retraction of the quill is programmable and thrust pressure adjustable.